Dynamic Yield is a leading provider of automated conversion optimization tools for online marketers, publishers and retailers. With a proprietary platform that delivers the right promotions, content and calls-to-action to every visitor in real-time, Dynamic Yield is able to personalize every stage of the user funnel and quickly maximize user engagement, conversions and overall revenue. "Great Product & Amazing Team"
Dynamic Yield was incredibly easy to implement. When they tell you its a few lines of script, they really mean it. We were up and running within a day of our developer placing the script on our site and could start testing and personalizing right away. The tool does take a little getting used to. I wouldn't say that it is super intuitive, but once you've had a training and have learned the DY lingo, write your own test and it will be much easier to decipher the steps you need to take in order to get your campaign running. Our account manager is incredibly responsive and always willing to help us setup a test and give suggestions on future targeting and testing we could be performing. I like to see this in account management as there are many people who let the relationship die off, much more of a use or lose it approach. Our DY account manager has made sure that we are constantly using the product and seeing the value it can bring to our company. The tool itself allows us to quickly turn on and off campaigns. This is incredibly helpful in case you find a bug or are trying to run a quick promotion on the site, mitigating the need for site replications. Lastly, the roadmap that DY has is incredibly robust and feature requests seem to get into the queue quickly to improve usability. The more campaigns we run, we have seen performance slip a bit. We have brought this to DY's attention and they have run an audit and provided additional suggestions to increase page load times when we are running multiple campaigns. We also are unable to share tags and segments with Adobe, meaning both need to be duplicated by the team. 1. Have a dedicated product or experience manager to use DY. Once you find the value in the tool, this person will be busy. 2. Have a roadmap. Don't sign that contract until you know exactly what you want to use it for. It's an investment that will bigger payoffs if you are prepared. 3. Be open to suggestions from the DY team and your internal teams. TEST TEST TEST. Testing! We have run into a vicious cycle of launching on site and watching KPIs from there. Not best practice at all and this could mean that you may have to revert a code push on the fly. Testing has allowed us to build the test in DY and report uplift (or none) from there. It helps us make better decisions in the long run. Personalization has been on our roadmap for a long time and DY is definitely going to get us there. Audience segments are easy to build and we can target these users with different content on our HP, which will hopefully result in a higher conversion rate, specifically on mobile. "Why I like working with Dynamic Yield"
It's well suited for any e-commerce, especially those with a large portfolio of product attribute/s... Personalisation will help users find what they want quicker. "Great tool for A/B testing and personalization"
With Dynamic Yield, modification of the website for A/B testing is easy. It allows us to run many A/B tests to improve overall CR. Implementation of the product recommendation is also very straight-forward. Account managers and support teams are always available to help if we face any issues. They are always open to feedback and implement new features/improvements quite frequently. For example, our team requested for social proof and Dynamic Yield customized it for us, then built it into a feature for all the users. The loading time can be improved and auto-save of the content would be super helpful. The data feed feature allows us to upload csv files for mass banner inserts which helped to improve the process. What Personalization Engines solution do you use? "Great experience with Dynamic Yield!" I like how easy it is to use, the support given and the learnings from our peers. It's also great that Dynamic Yield constantly asks for our feedback and builds additional features that we require. Support can be a bit slow sometimes, and we are unable to work on different sections (e.g. Philippines, Taiwan) concurrently - will have to go incognito or use a new browser. Page also hangs at times and can't revert to past version. It's a really great platform for users who have no prior experience to A/B testing or personalisation - really user-friendly! And has all the features we require at the moment. For my team, we use Dynamic Yield to bring personalisation to the consumers, and optimise our efforts in terms of conversion rate, bounce rate, etc. "Great tool for AB testing and personalization"
Once the feature or test you'd like to run is implemented, reiterating and scaling is so simple. As an App SDK user, the features that roll out are slower than Web and hence we aren't as capable of keeping up with new feature development DY releases. Have a team that can scale Dynamic Yield and a company that supports the vision of what the team wants to accomplish with Dynamic YIeld. AB testing and personalization. AB testing was typically saved for small scale business impact but with Dynamic Yield, we are able to test not only which creative/copy works, but which UI will convert our users. In terms of personalization benefits, integrating our CRM data has been tremendously helpful when we are looking to target specific users in their customer journey. "Dynamic Content Tools - A Must for Every Marketers Toolkit"
I love that you can dynamically change up content based off of targeting certain audiences - really a key to staying relevant and valuable to your many people who buy your product/service. A/B testing is also a breeze - which really helps marketers know which content is best. The organization of renderings can be extremely messy if you use a lot of them or have a lot of pages. Its hard to keep track since you cant group like renderings on a page together easily and it takes up your whole feed. This makes DY not very scalable. What I love best is in the name; I love how dynamic the tool is. Honestly, we can do almost anything we dream up on our website in terms of testing or offering experiences to our consumers with Dynamic Yield. Our limitation is only on the development side to ensure we can open up integration points for the tool to control and utilize. My dislikes are less about the platform and more about the inherent complexity involved in A:B testing & personalization. The platform is very user friendly, once you understand how to use it. The implementation of the tool was a little more complicated than I wished it would have been. I desperately wanted a direct and streamlined Tealium tag integration with my Magento store. Hopefully the DY team can make that adjustment in the future. A:B testing for conversion rate, AOV, RPV and usability improvements. We've realized well over $1M in annualized revenue via a multitude of A:B tests that we've run on the site via DY. We redesigned a new homepage and were confident in the evolution because we were able to test our way into the update. My boss and her bosses are all VERY pleased with our results. My CSM is amazing. Really dedicated to making sure I get the most out of DY, my tests, and working with my organization. Personalization through product feeds and the level of complexity is amazing. You can target based off of weather, which is amazing. You can set up product type and actions to define your flows fairly easily, but again, my CSM was very helpful here. Auto Allocate is a great feature. Audience Manager is pretty cool. Allows you to define audiences also based off product feed and event actions. The 24/7 support is very impressive. Their chat is great at helping you overcome small issues or answering questions. Requires a developer for a lot of aspects. Not completely plug and play depending on how your site is built. Code editor is a little wonky, so best to write your code elsewhere and the paste into DY. I wish there was an editor similar to the one Optimizely has for setting up tests. I'm sure this is something I will see down the road. "Personalize your customers entire journey!" Dynamic Yield is suitable for organisations that want to serve a tailored and personalised experience for each user. It will be particularly relevant for sites that have a wide range of customers and thus need to cater to their different needs. Dynamic Yield is also particularly relevant for companies that are data driven and make their decisions based on data and not just gut feeling. This is, however, not a website building tool. Focused on e-commerce - it's clear to see that DY's focus is on e-commerce, which has been great for us. Starting from e-commerce focused reporting and analytics, pre-made templates for experiences that are known to be best practices for leading e-commerce site at your fingertips, and streamlined e-commerce focused targeting capabilities, KPI's and objectives. Maturity - though DY's solution answer most of our needs, it's clear to see that the solution is relatively "young". - There are many things missing or lacking. Most aren't crucial, yet altogether it has a great impact on our ability to make the most out of the solution. Looking for personalizing your site like Amazon? Testing new offers, creatives, new or improved features? go for it. Looking for a simple, code-less tool for testing banners and texts - use something simpler and cheaper. To leverage DY's solution will require front-end abilities and effort. I'd say that the minimum should be around 25% of a Front-End Developer's time. We use it for two things: i) testing different creatives, offers, UI and new or improved features, and ii) creating personalized experiences for specific audiences, whether it's geo-based targeting, traffic source based or on-site behavior. "highly flexible marketing tool "
"Recommendation, optimization and personalization made easy"
What we love the most of Dynamic Yield is how easy it is to create experiments that let us compare 2 or more variations. The feature of targeting the right users/pages/context for the experiment cover pretty much everything we wanted and the process of setting it up is very easy. The recommendation engine is another feature that we love. It's very easy to try different strategies to understand what performs best in each case, and using the templates you can save tons of work to set up new recommendation experiments (yes, every feature is an experiment from now on). Moreover, the direct revenue and assisted revenue metrics give great insight on what is just holding the user on the site and what actually shows what users wanted to buy (both are great results though). One thing that we find limited is the rules you can set in the strategy for the recommendation. Especially the similar products one has the possibility to define fields that must match and field that must not match: we'd like the configuration to be more flexible. Another thing we struggled with is the product feed. We have a different price list for different countries and we handle multiple languages. Representing all those information in one feed is pretty hard, and moreover, there's a strong limitation on the number of fields available for the feed. Basically, the product feed engine should be boosted. If you want a tool that let you easily modify your UI, acting directly on your final HTML, personalizing the experience for your users and collecting data for understanding which variation performs better for which audiences, this is the tool for you. - if we were using just the recommendation widget, we would have had a ROI of 2.5x considering the whole investment on Dynamic Yield. It lets you testing hypothesis without having aa big impact on the development processes (generally). If a company want to dive in the CRO approach, testing almost everything, a tool like Dynamic Yield really help. "Perfect Tool with amazing support"
For us, we've used Dynamic Yield on many occasions, MVT, A/B Dynamic Pages, Messages etc, whereby it has worked perfectly. The best has been the render of 5,000 locally targeted pages, for us resource to deliver these pages would have been years away. Being able to switch on this function within weeks of gaining the tool has been amazing. Reporting is available through their Dashboard - it would be great to get access to the raw data. Have a chat with the support team - they are the best i have dealt with. We are now featuring in 5,000 separate locations around the UK, whereby this would have cost hours in web development time creating each page. I would say this could have resulted in thousands of pounds of savings due to having these pages dynamically rendered. We run monthly Multi variant tests on site. with many proving positive improvements in conversion. We've seen tests which have resulted in savings amounting to double the investment made in Dynamic Yield. "Dynamic Yield is a game changer"
I like that Dynamic Yield allows us to customize our customers' experience according to their interests, and allows us to A/B test creatives and messaging to those audiences. I don't like that the analytics are shallow and don't offer much customization, including custom date ranges or comparisons against other date periods. You will need to have a defined product manager for Dynamic Yield. Although many of its features are very accessible to the average user, you will get the most benefit out of it if you have a relatively experienced technical professional to manage the installation and continuing implantation of tests and experiences. We use Dynamic Yield to quickly deploy messaging on our site without requiring the work of backend developers. This has allowed us to bring solutions to market more quickly than we could previously, and has freed up those resources to concentrate on other projects for the company. The testing functionality is very easy to use and clear to find out what is working and what isn't. The support service is one of the best I have ever dealt with. Sometimes the portal, even though is very user friendly, can get a bit complicated and takes a few tries to get right. However, once you understand the process it all makes sense! Easy customer journey testing, changing elements on the website quickly without having to request from other teams. "Testing & Personalization with Dynamic Yield"
Very easy self-service platform, but with a lot of customization and templating options to get advanced results with less engineering support than traditional engineering built solutions. Considering how advanced the platform can be, there are some things that aren't possible like incorporating more client APIs or allowing for more product feeds, which would help us use the platform even further. Great self-service platform with lots of pre-built templates and ability to get pretty advanced. However, I think to make the most of it, you need a development team supporting you to help customize or build the templates to allow the marketers to do as much as possible. It segments our performance, so we can accurately measure improvements. Unlike other tools Dynamic Yield is easier to use. It is currently being used for testing and optimisation by our marketing department. It helps improve our website by identifying segments and allowing us to test against these. Product recommendations are one of the strongest features of Dynamic Yield. The ability to A/B test experiences and compare them to a control group has allowed us to make educated decisions on the content we are displaying. We also use Dynamic Yield as a Content Management System, scheduling content changes on our site from hero images to promo boxes to special offers based on gender, weather & interests. Reporting is amazing as well and gives great insight into the experiences and experiments we are running. There really isn't anything that we dislike, but the product recommendation builder is a bit clunky. It's not intuitive and there are quite a few steps to get it up and running. If this could be simplified, it would save us some time. We'd also like to see a little more intelligence built into audience profiling by gender. As of right now the criteria is quite simple (Men - visited at least 5 men's pages and zero women's pages), and can provide some false positives. We are much more efficient as we are managing most of the content on our homepage through DY. Almost our entire homepage is dynamically built, delivering personalized experiences for each customer. Simplicity of the product, so that non-engineering users can still do a lot of things. Integrated dashboards and analytics. Timely response from an account manager for any issue. Overall the product is great. Some product features could be helpful, e.d. more sophisticated access management and logging for system users, because we have a couple dozens of them already. Dynamic Yield is a platform rather than a service. You get as much benefit as you put effort into implementing your ideas. It is helpful to keep few percentage points of your web site users without Dynamic Yield code at all in order to track your revenue uplift and to keep an eye on ROI from the project. We are working on conversion optimization and personalization of our web site to our users. We get up to 5% uplift in revenue per user according to our split test measurement. "Warning! Will dramatically improve conversion!" Custom Actions have enabled us to bridge the gap between our online/offline worlds. This has seen vast improvements in our conversion rates as we have been able to test things that ordinarily would have involved our internal IT developers. If you can think of a test you can create it, the problem is sometimes knowing where to start. Luckily the support team are superb and are always on standby to help. You need this in your business! The out of the box features mean we can quickly and easily create a test in under 24 hours with involving our internal IT developers. "Highly recommended personalization platform for all e-commerce sites"
Some functions hadn't worked properly especially for multiple-category products. I use Dynamic Yield to run tests on our subscription and shop flows. It's an easy-to-use and robust tool that helps us improve our overall site. The front-end editor can be buggy at times. Dynamic Yield is well suited to run on-site test quickly and seamlessly. DY has helped us increase our conversion rate. broad spectrum of products which enable complete personalization of your website. because its so powerful it can be heavy on the page load time. pre-trial, test if it suits your company needs. heavily used in brand and content marketing, gives the possibility to AB test and set recommendation strategies. The ability to target specific audiences and serve them a personalized experience. Rather than doing A/B testing, you can serve several different variations to a specific audience and using dynamic yield's machine learning algorithm, determine which experience is most successful. So far, the reporting tools are not as accurate as they should be. In comparing to test and target, the reporting has too wide a variation between what test and target shows, vs what dynamic yield shows. Make sure that the data feeds and crm feeds are set up properly. Cross check with other reporting software. Being able to present relavant content and products to customers. Rather than serving one experience, we can serve a unique experience to each customer based on browsing habits, purchase history, etc. "Hard to use and could not see ROI. Horrible support"
I enjoy the way they approached the whole sales process. Their sales rep was very helpful and found a way to convince us very easily. I should probably hire him for our business. Please try other companies. I am sure there are a lot of vendors offering a good product with decent service. They totally destroyed my trust in the brand and the product. They claimed to grow our AOV, cart size and reduce shopping cart abandonment. While we did see the needle move an inch, there wasn't a clear difference proportional to the investment we made. Incredible personalization platform and easy-to-use interface makes building personalized, targeted, recommendations on our e-commerce platform very seamless. It's a little less "self-service" in some regards, especially since our primary use case also revolves around A/B testing and using them as a CMS. On-site recommendations and self-service CMS,. "drive good results and supportive customer service"
"Testing Dynamic Yield with a news website"
A/B testing is quite easy and analyzing the results is intuitive. Dynamic Yield provides lots of different options for different tests. It can do lots of different stuff, but sometimes too much technical knowledge is needed. 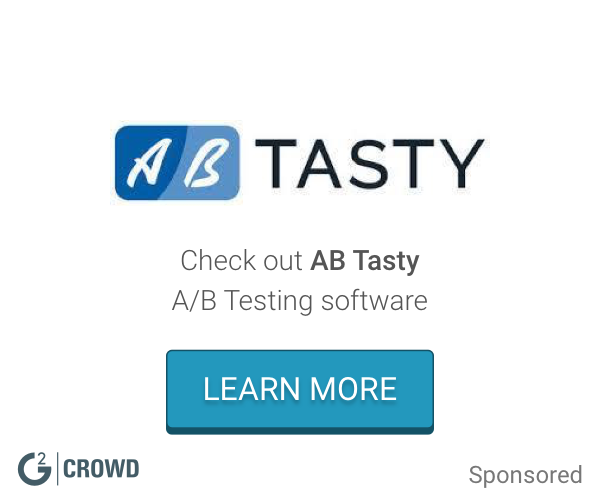 "DY great tool and strong A/B testing platform"
I really enjoy the A/B testing on D. This is where I spend a majority of my time. DY can sometimes be so complex, that setting up easier tasks are more complicated than they need to be. "DY performs well but there is a lot of good competitors out there"
It really bothers that support chat personnel changes all the time and usually it takes a long time for them to undestand my issues. I am trying to increase CTR (which leads to more B2B sales), which DY has helped us with well. "Small dev shop using dynamic yield"
A great alternative to Optimizely. You can setup varations for AB testings and popup modals directly in DY with their standard templates, or create your own with custom HTML/CSS/JS that is injected into your site. The admin interface takes some time to get use to. It is very Object oriented, so some steps in the process are on separate screens. "Dynamic Yield does what you want, might be hard to get there"
The testing and capabilities of Dynamic Yield are plentiful. The user experience setting up experiences or tests from a marketer's stand point is not great. Because there are so many different capabilities, it is almost too hard to complete an everyday task. You will need a dedicated team member to manage this platform as well as a group of developers to help execute your experiences. Dynamic Yield is helping our conversion rate on our website. "intuitive, powerful and very flexible for running complicated personalization campaigns"
Dynamic Yield's platform is intuitive, powerful and very flexible for running complicated personalization campaigns, audience segmentations and ongoing web optimization initiatives. As the system is built to serve many different use cases, we sometimes feel like we are unfamiliar with all of the system's features. Despite it being an advantage in certain aspects, not having an "off the shelf" product may complicate some workflows. The platform provides an optimal solution for critical aspects of any media and eCommerce websites. The platform provides a solution which is extremely helpful and useful for decision making, ongoing optimization, personalized campaigns and drawing comparisons by performance data. * We monitor all Dynamic Yield reviews to prevent fraudulent reviews and keep review quality high. We do not post reviews by company employees or direct competitors. Validated reviews require the user to submit a screenshot of the product containing their user ID, in order to verify a user is an actual user of the product. Hi there! Are you looking to implement a solution like Dynamic Yield?